We had a great time demoing Here Come The Dead at the TAVES Consumer Electronics Show on November 1. We were part of the TorontoVR showcase that included other local developers in a corner of the New Technology area. About 75 adults tried the game over the seven hours we were there. Enjoy the following highlight reel from the show! Gnometech will be attending the TAVES Consumer Electronics Show on November 1 as part of the TorontoVR community showcase. We’ll be giving demos of the new Unreal Engine 4 and Oculus Rift DK2 version of Here Come The Dead to all TAVES attendees (admission required). How many zombies can you take down before time is up? 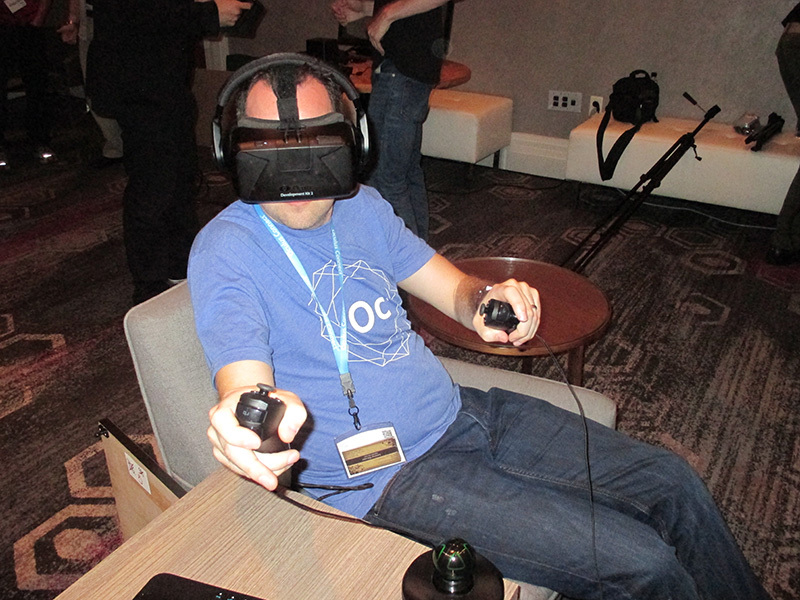 Oculus Connect 1 was held at the end of September at the Loews Hollywood Hotel. It was a great chance to mingle with other virtual reality developers and share our projects. On Saturday night we were able to give a demo of Here Come The Dead to the Oculus Developer Relations group. The lead up to this was a 3 week crunch to get Here Come The Dead up to the same level we showed at DigiFest 2014 in May, but this time using UE4. As this ended up being the last demo of the night, we were able to make use of the conference hardware to show off the demo to some OC1 attendees until they kicked us out, as seen above. We look forward to the next Oculus Connect! Culture Toronto attended Digifest 2014 and published a video showcasing people playing Here Come The Dead. They also interviewed a show attendee about the game. Enjoy! We had a great time showing off Here Come The Dead at Toronto’s Digifest 2014 Intel Family Day on May 9. Nearly 100 kids and adults tried out the game during the six hour show. Enjoy the following video that captures the excitement! Gnometech will be attending DigiFest 2014 Intel Family Day on May 10 with the first public showing of their new game Here Come The Dead. The first level prototype, which makes use of the Oculus Rift and Razer Hydra, will be playable by the public at the show. Come shoot some zombies with us!